I was asked to participate in this year's Art Amsterdam 2010 by artKitchen gallery. Their theme is food and they are putting together a book to accompany the show. "Captain Kawaii" was selected for the book and below is the first of what I hope will be four total pieces I will have at the show. 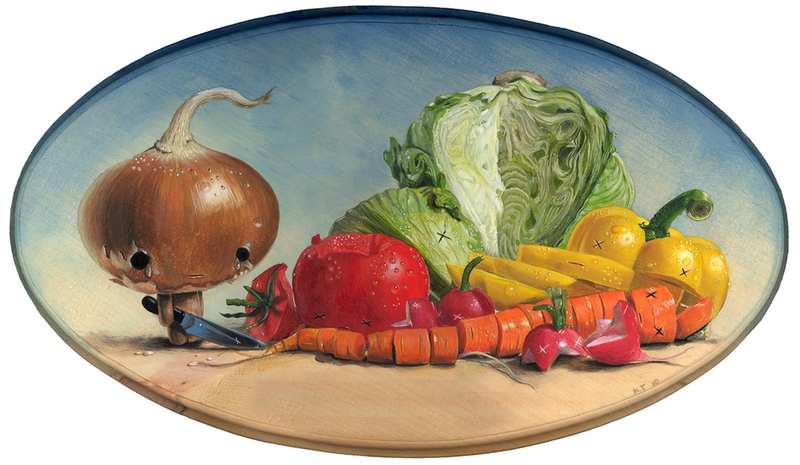 "Slice and Dice" 15.5" x 9" acrylic on custom wood plaque. Since things have been a bit difficult on both myself and Ed, we decided that it was time for a short vacation. We've never been to Amsterdam (or the whole of Europe for that matter) and will be flying in the last day of the show. Enjoy.